Eric Johnson's contribution to the modern-day, electric Blues style cannot be overstated. He was even featured on the first G3 tour, alongside guitar virtuosos Steve Vai and Joe Satriani. His classic 'Ah Via Musicom' and the unforgettable opening fantasia on 'Cliffs Of Dover' made him an overnight sensation in the eyes of both guitarists and popular music aficionados alike. However, an overnight sensation he was not. Johnson spent years on the Austin, TX club circuit perfecting his technique and tone well before the popularity he still holds today. Now, twenty-six years after that seminal release and two years since the collaborative venture with Jazz guitarist Mike Stern entitled 'Eclectic', fans are treated to his ninth solo album with 'EJ'. It's an all-acoustic album, featuring mostly original material, but also including covers of Simon & Garfunkel ('Mrs. Robinson,' 'Scarborough Fair') and Jimi Hendrix ('One Rainy Wish'). It should come as no surprise to those familiar with Johnson's material that his all-acoustic debut would fall anything short of excellent. 'EJ' is an exceptional foray into the world of finger-style and Johnson's mastery of said technique on the opener '...Robinson', 'Song For Irene' and 'The World Is Waiting For the Sunrise' is exquisite. His simultaneous control of rhythm and melody makes for such technically challenging material sound deceivingly simple. Much like his previous albums, Eric Johnson's soft, gentle vocals decorate many of the tracks, and his skills on both piano ('Water Under The Bridge') and nylon-stringed classical guitar ('Serinidad') are also on display. As with previous albums, his artistic vision and musical integrity remain intact, even after shedding the effects and amplifiers. He is able to distill the influences of acoustic guitar legends Leo Kottke, Michael Hedges, Preston Reed and Adrian Legg while still maintaining his own identity. 'EJ' will reinforce to existing fans what they already know about this Texas native. 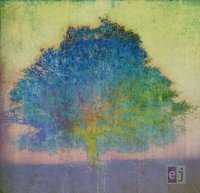 For those who might be looking for some heady acoustic playing, along with some serene compositions, 'EJ' is a mature and complete musical statement.